Supplementary material reads: "Disneyland's second annual Easter Parade drew thousands to the fabulous Anaheim Park. Authentic historical costumes from the collection of Mrs. Helen Larson, Whittier, were worn by promenaders on Main Street. Antique cars were driven by members of the California Horseless Carriage Club in the colorful spectacle. Neg. 117: Mr. and Mrs. Cecil Frye, San Gabriel, drove their 1908 Reo in Disneyland's second annual Easter Parade which drew thousands to the fabulous Anaheim Park. Neg. 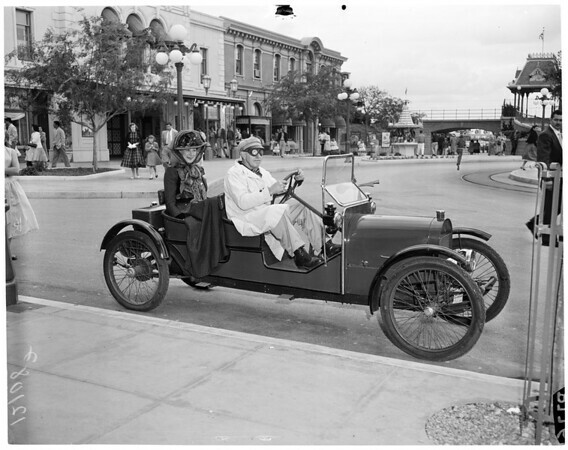 142: Mr. and Mrs. Rig Petri, Burbank, drove their 1912 Buick in Disneyland's second annual Easter Parade which drew thousands to the fabulous Anaheim Park".